Whenever people ask me what my favourite destination I’ve travelled to so far is, I struggle but I usually come to the same answer: Vietnam, and that’s mainly for the coffee. When I turned up to Hanoi in October as part of my first solo backpacking trip, it was an assault on the senses. Hanoi’s old quarter is a labyrinth of crazy chaotic roads, motorbikes coming at you from all directions, women selling eels at the side of the road, little alleyways with mismatched shops and street side restaurants with people perched on low seats slurping bowls of pho. I was captivated straight away and couldn’t stop walking around with a huge grin on my face, although the traffic did take a little getting used to. (I spent the first evening eating a bowl of cereal for dinner because I couldn’t cross the junction to get to the restaurants). However the one place I found solace in the city chaos was in the coffee shops. Coffee in Vietnam is as big as tea in England and wow, the coffee was good. There are so many different ways to have coffee in Vietnam and I couldn’t wait to try them all. What’s best is that coffee in the country is so dangerously cheap, (Costing around 20,000 dong or 66p) so it wont even make a dent in your budget. I will always remember my first coffee in Hanoi. It was an egg coffee or (Ca Phe Trung) at Cafe Pho Co. I’d read about this cafe and its trademark coffee in my Lonely Planet guide and finding it was a real adventure. Located by the Hoan Kiem lake the entrance to this hidden gem is entered via a silk shop that I only found by putting its location into google maps. At first I wasnt sure if I was in the right place and as I walked in to the shop I was almost run over by a man on a motorbike who came racing past me out of the door. Welcome to the craziness that is Vietnam! I kept walking through a narrow corridor and then sure enough the shop opened up into a beautiful cafe courtyard with a winding stair case going up several floors. I wandered up to the top floor where I was met with breathtaking views of the lake and I attempted to order my first egg coffee, with my very limited Vietnamese. If you love coffee then you have to try egg coffee in Vietnam. I had no idea what to expect but I absolutely loved it. 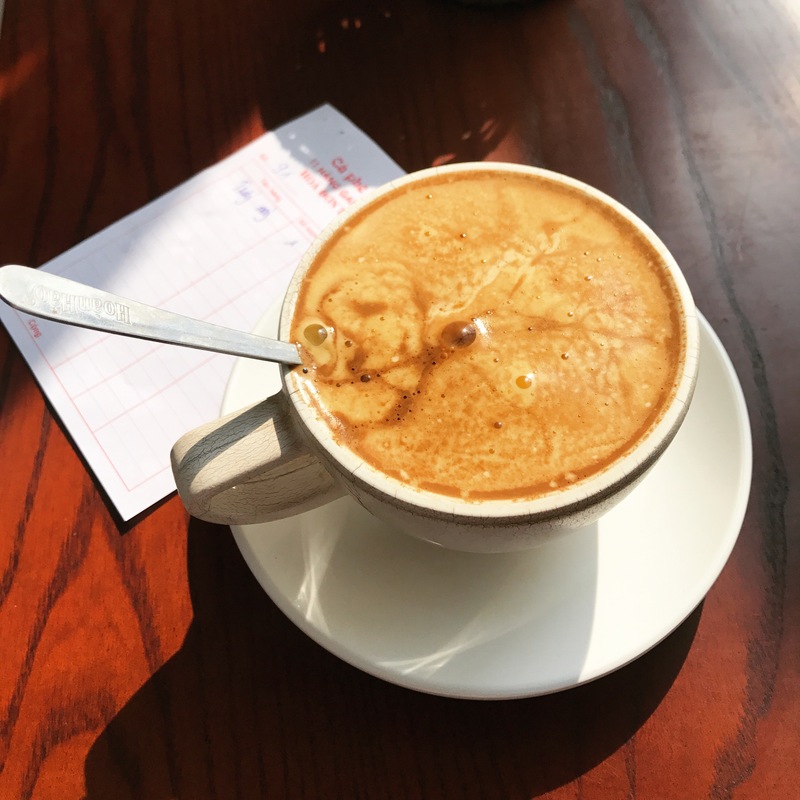 This drink is particularly popular in Northern Vietnam and the consistency of the drink is that of a wet meringue but it has a sweet yet deep coffee taste that makes it totally addictive. I first got addicted to condensed milk in drinks in Thailand where it is used to sweeten the ashy coloured Thai milk tea, but Vietnamese coffee with condensed milk is something else. This is the most common way to have coffee and I go served this numerous times in restaurants, hostels and cafes. The coffee is filtered through a Phin (picture above) which is placed on top of a cup that already layer of condensed milk in it. When the coffee has filtered through, simply mix it with the milk. If you’re not keen on milk then you can ask for this black (ca phe den nong: This translates as coffee, black, hot). This will come sweetened. I tried ordering this without any sugar once (when I was trying to be healthy) but it’s just not nice. Vietnamese coffee isn’t like at home and the pure coffee is bitter and sour rather than smooth and sweet like an espresso. Iced Vietnamese coffee is another really popular drink served in cafes. In fact one day I went to a little roadside cafe filled with locals and no menu and simply asked for coffee and this is what I got. This iced drink is served in a tall cup with the condensed milk already added, so it is lighter in colour. It usually comes with a free glass of iced tea (Something sold for next to nothing in most restaurants too). If you don’t want milk then order it black (Ca Phe Den Da: Den being black and da iced). This comes with some sugar added, you can usually choose how much e.g medium sweet. Again I wouldn’t recommend having it without any sugar in, it just isn’t nice. Sometimes when you’re travelling for a while all you want is a normal coffee just like at home. There are plenty of places that you can satisfy your caffeine craving in Vietnam. If you’re after somewhere a little more culturally enriching than Starbucks then I recommend the Highlands coffee chain. This Vietnamese coffee chain has locations all over the country from Ho Chi Minh city to Hue and Hanoi. They have both the traditional Phin filter coffees and espresso based coffees such an Americanos, lattes and cappuccinos. If you don’t have dairy then don’t worry as soya milk is very popular in Vietnam so it shouldn’t be an issue. I really loved this place because they give you a little phone that rings when your order is ready, it’s usually full of younger locals and they have great wi-fi. I sheltered in one of these cafes when I got caught in a typhoon in Hue. So that’s it: Now you’re already to go to Vietnam and order some coffee for yourself. I hope this post has inspired you to dive straight into the country’s fantastic coffee culture. Vietnam is a country that runs on coffee, they produce it, they drink it and they value it and as fast paced, hectic and chaotic a country it might be, sitting in a cafe waiting for the coffee to filter through a phin, that’s when Vietnam slows down. Why not step inside some of Vietnams best cafes and read my cafe reviews here.